I had a very good first-half of 2017. Then, halfway through, Dad got bitten by a snake, and I was hospitalised with a severe case of anaphylaxis. Dad's doing better now, but then Gramps fell ill. I have allergy tests scheduled for next week. So I hope 2018 is a lot better. To signify a fresh start for this year, I decided to do a fresh-faced makeup look. Dewy and soft, with very sheer foundation. Some mild peripheral warmth - no great contour. Soft neutral daytime-smoky eyes, and a gorgeously dusty-rose lipstick with coral undertones. 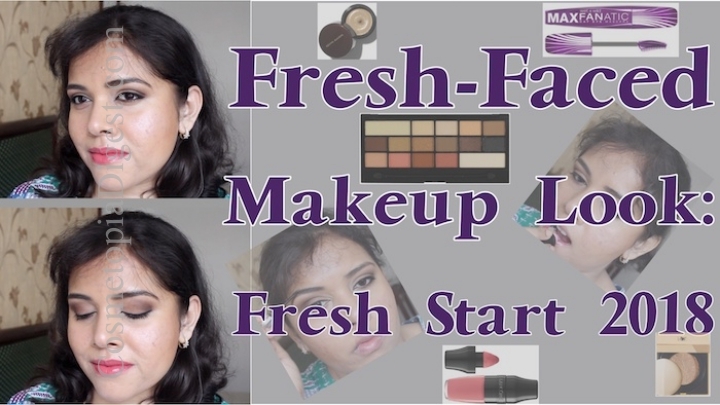 Scroll down for a wearable, fresh-faced makeup look tutorial, to make a fresh start for 2018! This year, I'm planning on incorporating more drugstore products into my makeup routine. You know my favourite drugstore brand is Bourjois, and I use a lot of their products. I want to increase my use of other brands, such as Makeup Revolution, Rimmel, Max Factor, Wet N Wild, Milani, and so on. You notice I've left out about some BIG names among drugstore makeup brands. Two of those, you'll never see on this blog. I won a giveaway from one; they never sent my prize. The second one took exception when I disliked some product of theirs. So I won't use their products. As simple as that. This doesn't mean I'm curtailing my use of department store brands! Never going to happen. It only means that you can see both categories in looks, side by side. I also plan on going drugstore-only for some staples, such as eyeliners. That said, there is one category where my product choices are department-store centric (except for Bourjois) - foundation. Especially after my 2015-'16 acne attack. I feel dept store foundies do better on my skin. Yes, even more so than Bourjois Healthy Mix. What about you? Do you prefer drugstore or dept store makeup? Any particular reason? Please do share! Right. Back to the look. Here is the tutorial. Please give the video a thumbs-up, and do subscribe to my channel!